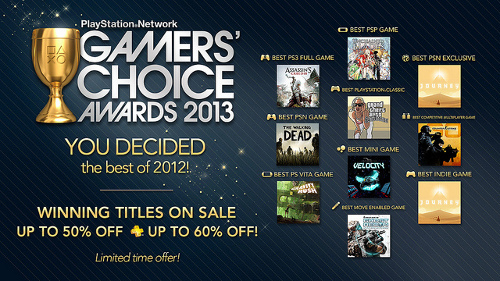 Sony Computer Entertainment of America recently announced the winners of the 2013 PSN Gamer's Choice Awards, ranking PlayStation Network games from the previous year across ten different categories. We'd be lying if we said it was a surprise to see thatgamecompany's Journey topping the user-voted list, strutting away with both Best PSN Exclusive Game and Best Indie Game. Everybody loves them some co-op, right? All of the winning games will be on sale from now through Monday, March 4th, discounted by as much as 50%. In addition, PlayStation owners in the U.S. can take advantage of a PSN-wide deal that offers $10 back for every $50 spent. Translation: get games now!